Tableau I. The merchants of Novgorod are sitting down to a feast, rejoicing in their prosperity. Nezhata, a singer and gusli player from Kiev, sings on the heroic days of his city´s past. 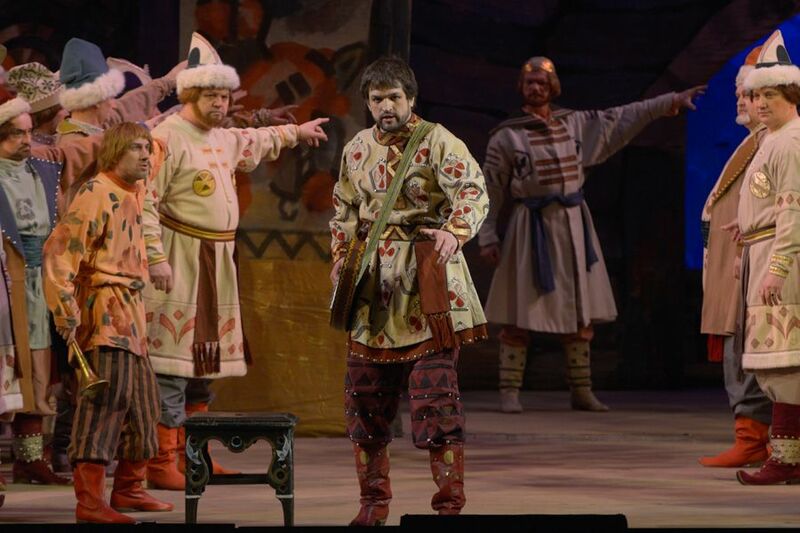 The merchants would like one of their own countrymen to sing about their town and the minstrel Sadko, who enters at that moment, is asked to oblige. 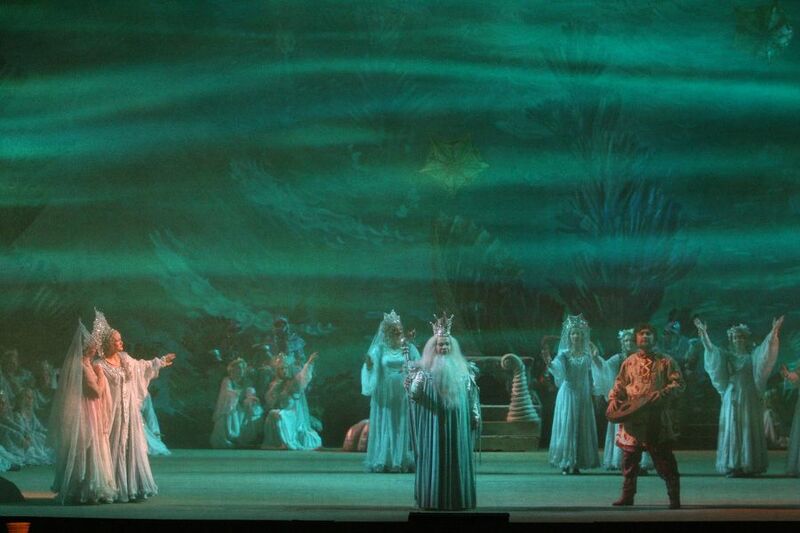 But his song disturbs them: Novgorod is on a lake, he sings, with no access to the ocean. If only their ships could reach the sea they would bring back fortunes from all over the world. The merchants laugh at him and send him on his way, and the feast continues with singing and dancing. Tableau II. 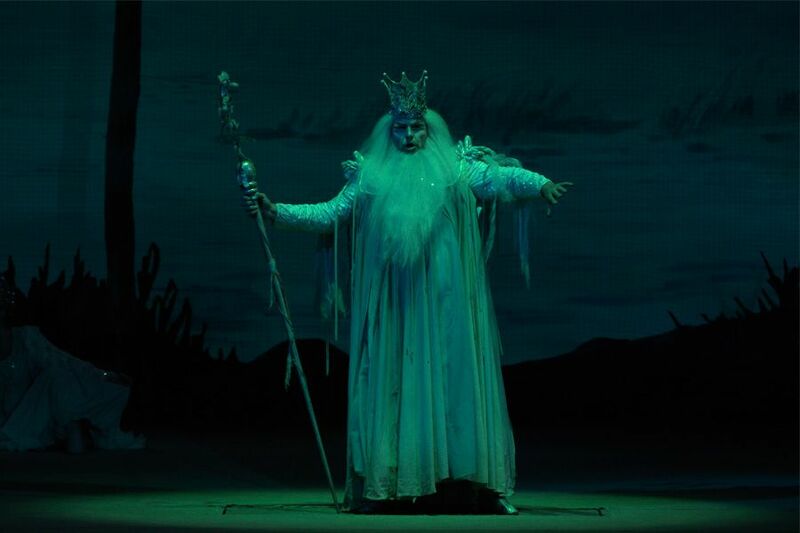 On the shore of Lake Ilmen Sadko sings of his sadness and disillusionment: "Oh, yon dark forest". 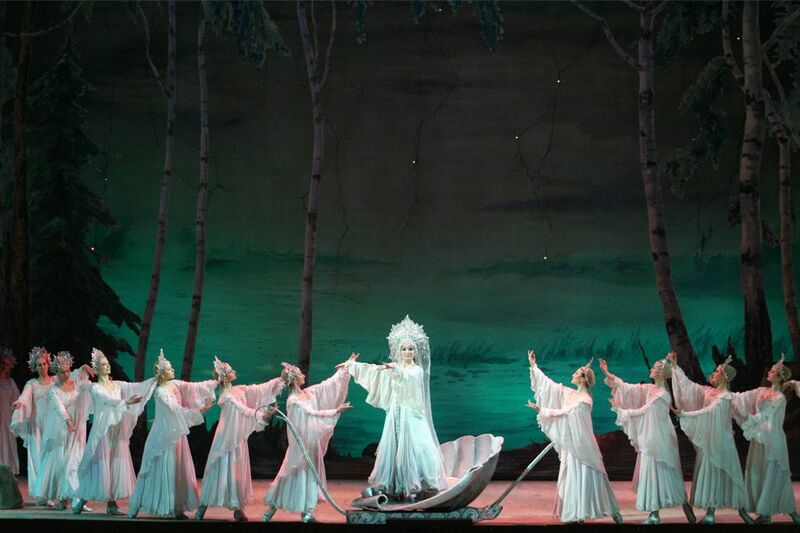 Sadko´s song is heard by some young maidens. Amongst them is Volkhova, daughter of the King of the Sea. He sings for them again and they dance. Volkhova tells him that he has won her love. 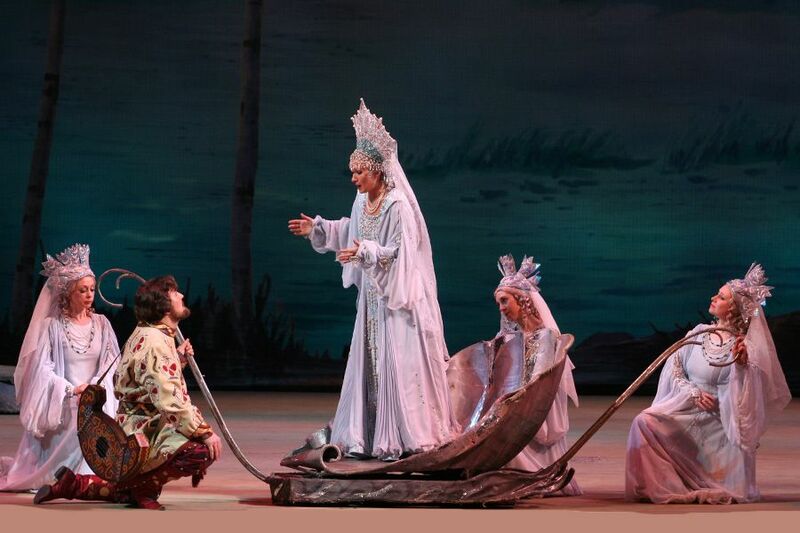 As dawn breaks, they part, but Volkhova tells Sadko that he will catch three golden fish in the lake, that he will make a journey to a foreign land, and that she will faithfully await his return. She returns to the deep and the kingdom of her father. The sun rises. Tableau III. Sadko´s wife Lyubava is lamenting her husband´s absence. Has he gone to seek adventure far away? It was only yesterday that he assured her of his love. 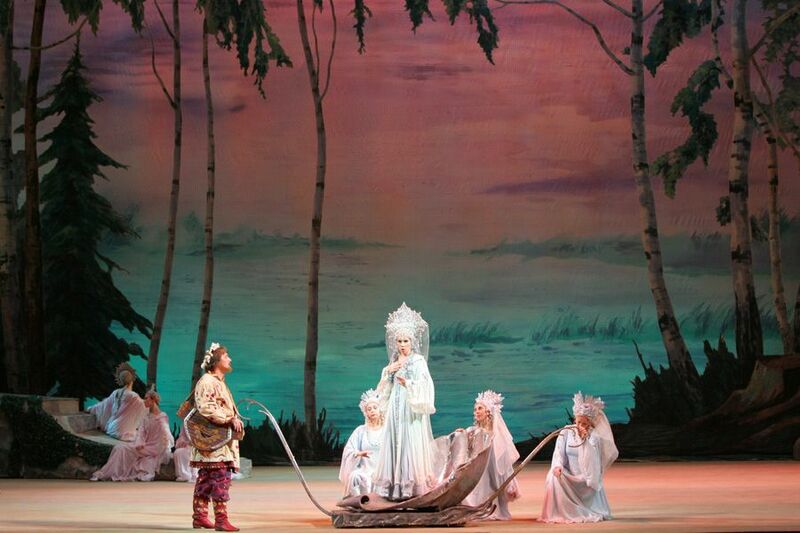 Sadko enters and she rejoices, but is broken-hearted when he soon leaves her again, crying out "Farewell!" Tableau IV. The port of Novgorod on Lake Ilmen. Ships lie peacefully at anchor and the townspeople crowd around the rich foreign merchants who have arrived from every land known to man. Soothsayers ply their trade, Nezhata sings to the accompaniment of his gusli, buffoons sing and dance, and a pilgrim´s chant can be heard. 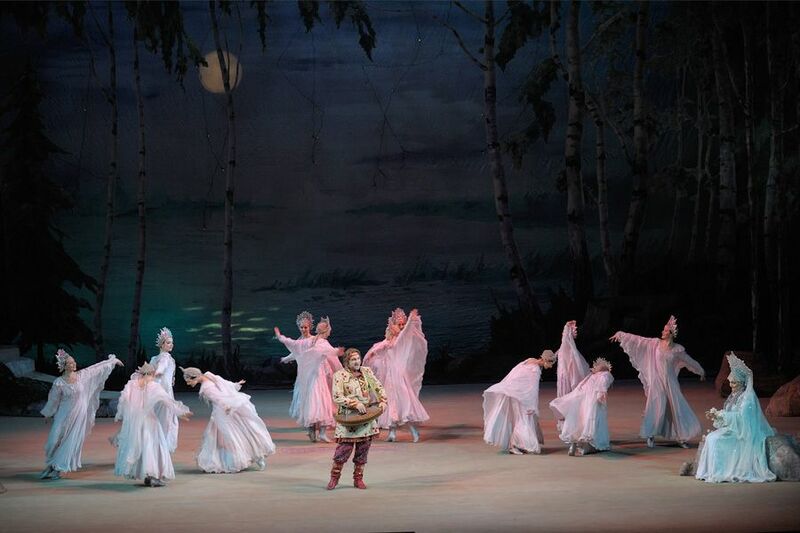 Sadko appears and is greeted with laughter, which increases when he tells them that he has learned a secret: there are golden fish in the lake. He bets his head against the wealth of all assembled at the port that he can prove the truth of his words. A net is set and the song of Volkhova, the Sea Princess, is heard. Sure enough, when the net is pulled in it contains three golden fish. Sadko invites all the adventurous men of the port to join him on his forthcoming journey and they go off to make their preparations. Nezhata sings of the nightingale which became a great merchant. Sadko returns and announces that he will restore to the merchants their wealth but he intends to keep their ships. He asks three merchants, a Viking, a Venetian and an Indian, to sing of their native lands so that he may decide which he should visit. The Viking sings first: his country´s shores are rugged, the sea rough, and his countrymen fierce warriors. This slow, pleasant aria is one of the most famous in the Russian bass repertoire. Next comes the Indian merchant. His music and his story are of a much more exotic cast. India is a land of gems and mystery, he sings the stuff of which dreams are made. The last of the merchants is the Venetian, a baritone, who sings a gondolier´s song or barcarole. 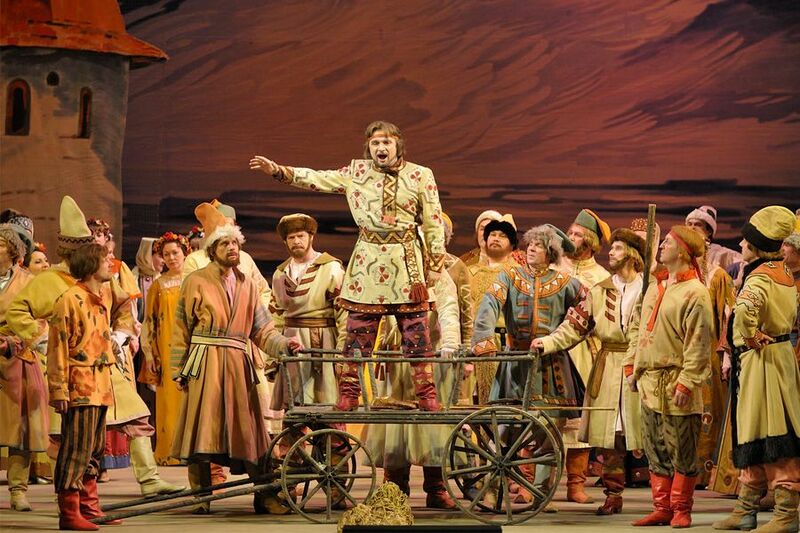 Sadko decides that Venice is for him and sets sail, asking the people of Novgorod to take care of his wife. Tableau V. Sadko is returning home, his ships laden with treasure. 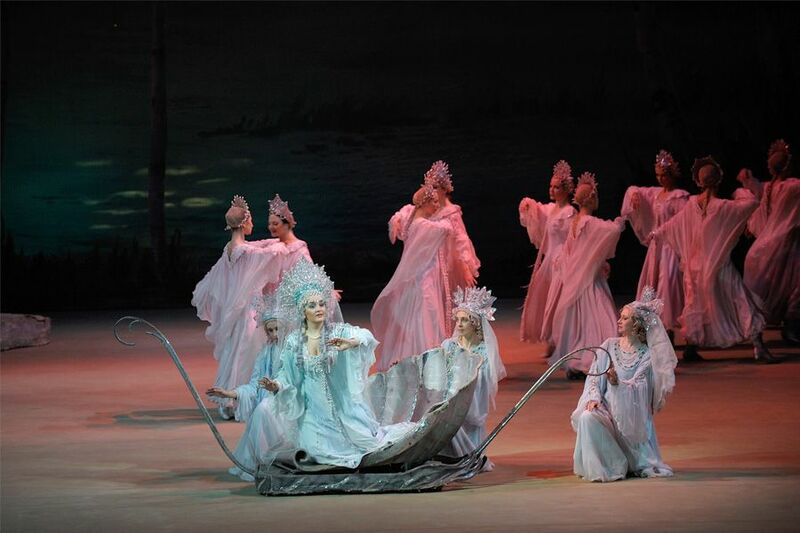 But they are becalmed, and Sadko decides that this is because in all the twelve years they have been away, they have never once made a sacrifice to the King of the Sea. The sailors pour treasure over the side into the water, but still there is no wind. At Sadko´s command, the sailors next throw logs overboard: Sadko´s sinks and he descends a ladder to the water´s edge, stepping onto a plank which has been thrown into the water. A breeze picks up immediately and the ship sails away, leaving Sadko abandoned. A mist settles. Tableau VI. When the mist clears we find ourselves at the bottom of the sea, at the court of the King of the Sea. The king and queen are seated on their thrones while Volkhova, their daughter, sits spinning seaweed. 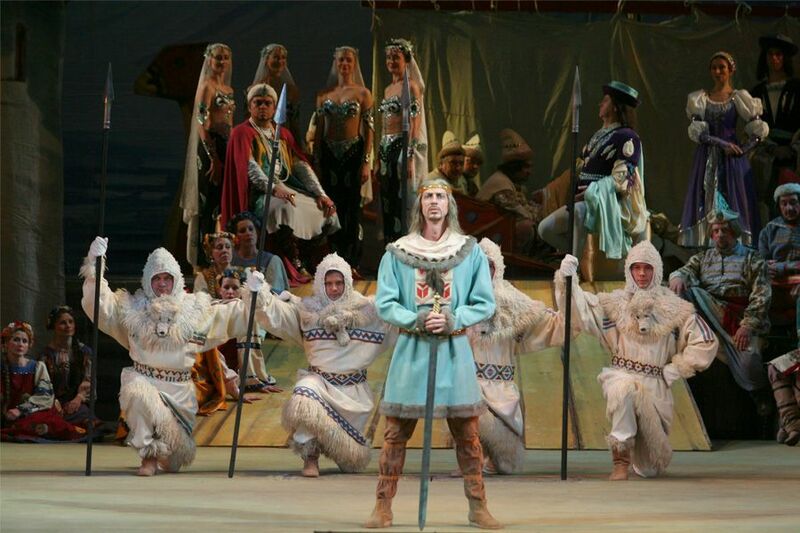 Sadko sings for the king and queen and is promised Volkhova´s hand in marriage. The wedding guests arrive – every denizen of the deep seems to have been invited – and the marriage is celebrated in a fitting manner. 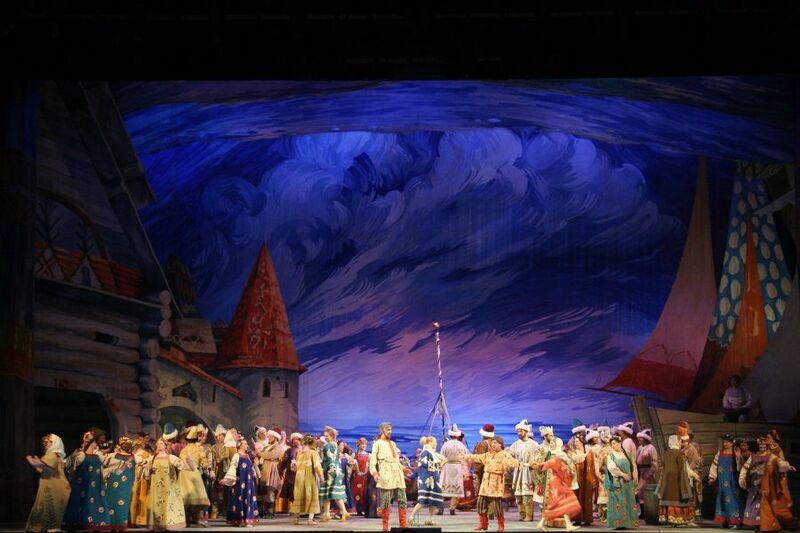 There are dances and Sadko sings again, arousing such enthusiasm that the listeners join in the dance. As their movements become faster and faster, the waves lash into a fury and ships sink down into the deep. An apparition then warns them that the reign of the King of the Sea is at an end and seagulls draw Sadko and Volkhova away in a shell. Tableau VII. Morning. 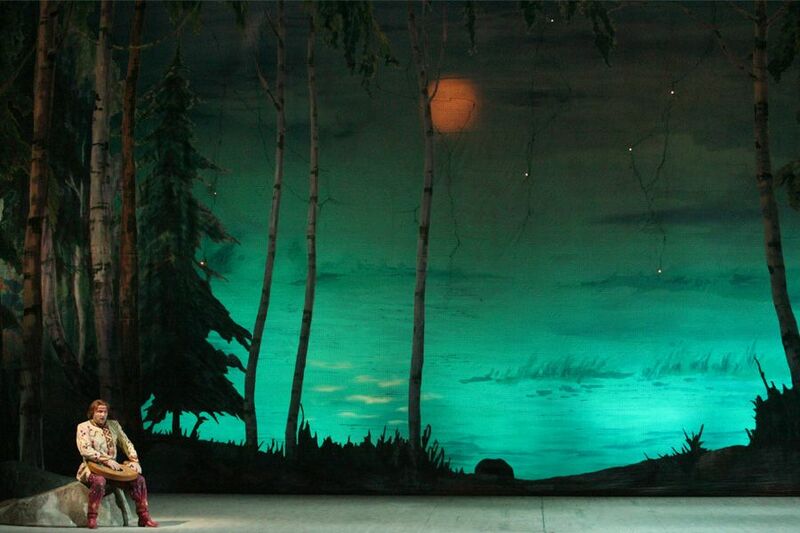 Sadko is asleep on the shore of Lake Ilmen, watched over by Princess Volkhova, who sings a lullaby. She bids a last farewell to the still-sleeping minstrel and then vanishes in the mist, turning into the great River Volkhov, which flows from Lake Ilmen to sea. Lyubava is distractedly searching for her husband. When she sees him asleep on the shore of the lake she is filled with delight. Sadko awakes. He thinks he has been asleep since he last parted with her, that his voyage was only a dream. But the sight of his fleet sailing up the new river from the sea tells him that it was all real, and that he is now the richest man in Novgorod. He is welcomed by the citizens of the town, among them the three merchants who sang for him before he set out on his long journey.